Do you have Pacific Islands ancestry? Stewart's Handbook was written by Percy S. Allen and revised annually. 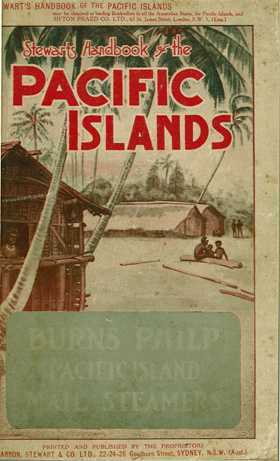 Each year a comprehensive account of all of the Pacific Islands is included. The book is divided into islands owned by New Zealand, France, Britain, USA, and Australia. It is then divided into separate island groups. Information on each group of islands gives a comprehensive history and geography of each island. This is often accompanied by information on government officials, trade statistics, churches, business, shipping, population, customs and tariffs, exports and lists of residents. It includes a map detailing the entire Pacific. This book is a valuable genealogy resource for those interested in the history of the Pacific Islands, and for anyone searching their family history in the area or building a family tree.